Mahru-Z is a walking robot maid with a rotating head containing a 3-dimensional sensor so it can figure out what work you need it to do. It can pick up your house, dump clothes into the washer and heat meals in the microwave. It is a bipedal, humanoid robot about 4.3 feet tall; Mahru-Z weighs just 121 pounds. "It recognises people, can turn on microwave ovens, washing machines and toasters, and also pick up sandwiches, cups and whatever else it senses as objects." 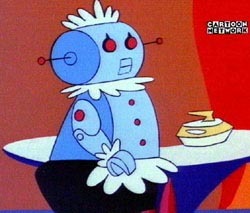 As a small child, I saw robotic maids clearly depicted in the Jetsons cartoon show. 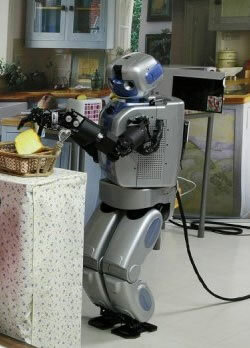 You'll probably recognize Rosie the robot maid (photo and video below). This excerpt from the Jetsons should give you some idea of what people expect robot maids to be able to do. Compare Mahru-Z with these other household devices - the RIDC-01 robot maid and the Toyota robot maid. From South Korean scientists develop walking robot maid.